Another year at the Sherwin-Williams CHL/NHL Top Prospects Game and the steady supply of Halifax Mooseheads talent just keeps coming. The Mooseheads have had a constant presence at the event over the past six years, a line of succession that started with Mastercard Memorial Cup champions Nathan MacKinnon, Jonathan Drouin and Zach Fucale starring on home ice in 2013 when the event came to Halifax. Following in the footsteps of Nikolaj Ehlers (2014), Timo Meier (2015), Otto Somppi (2016) and a standout performance from eventual first overall NHL Draft pick Nico Hischier last year in Quebec City, a Mooseheads quartet has touched down in Guelph eager to do big things. McIsaac will join teammates in forward Benoit-Olivier Groulx and goaltender Alexis Gravel on Eric Lindros-led Team Orr Thursday night, facing off against Mooseheads teammate Filip Zadina, a Czech star whose outstanding World Junior performance has propelled him into the spotlight. McIsaac, who played his midget hockey in Cole Harbour, Nova Scotia and names Sidney Crosby as his favourite player, was Halifax’s second overall pick of the 2016 QMJHL Draft, following teammate Benoit-Olivier Groulx who led off the proceedings. Mooseheads general manager Cam Russell’s vision to build through the draft has also brought Gravel (20th overall, 2016), Zadina (11th overall, 2017 CHL Import Draft) and talented 16-year-olds Xavier Parent (4th overall, 2017) and Justin Barron (13th overall, 2017) into the fold. While the club’s success has been a result of widespread contributions, Zadina has been outstanding, leading the team with 27 goals while also adding 26 assists for 53 points in 38 games. His coming out party at the World Juniors mirrored that of Hischier before the Swiss star went on to earn Player of the Game honours for Team Orr last January with a goal and two assists. The Mooseheads and their Maritimes Division rival the Moncton Wildcats both expressed their interest to bid on hosting the 2019 Mastercard Memorial Cup back in December. 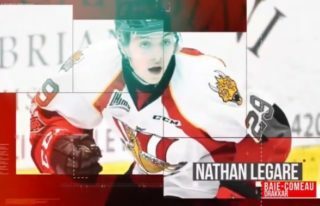 With Top Prospects Zadina, McIsaac, Groulx and Gravel accompanying other talented names in Parent, Barron, sophomore forward Raphael Lavoie and blueliner Jocktan Chainey in the Halifax lineup, the bid is important, but the franchise hasn’t lost sight of this season. 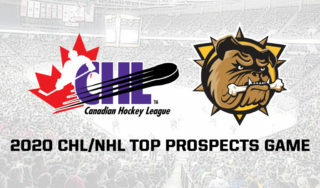 Catch four rising Halifax Mooseheads stars on Thursday night when the puck drops on the 23rd Sherwin-Williams CHL/NHL Top Prospects Game from the Sleeman Centre in Guelph, Ont. The game will be aired from coast-to-coast on Sportsnet, TVA Sports and in the United States on NHL Network at 7:00pm ET/4:00pm PT.